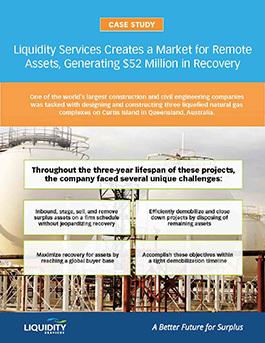 A leading construction and civil engineering company was tasked with designing and constructing three liquefied natural gas complexes on Curtis Island in Queensland, Australia. It needed an expert partner to sell and remove surplus assets resulting from these projects, and selected Liquidity Services to be that expert partner. Download the case study and find out how we helped this company generate over $52 million in recovery.